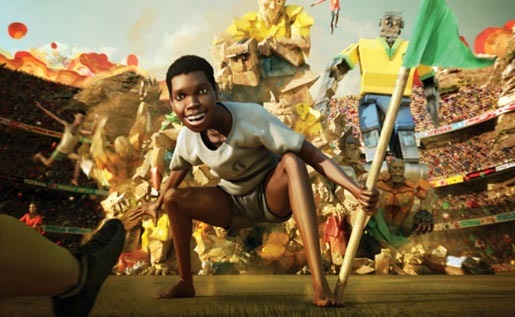 Coca Cola’s international FIFA World Cup 2010 Celebration campaign includes “Quest”, an animated video following the journey of a young footballer playing the game on a dusty lot in Africa. As he plays, he is seeking to find his own celebration. In his quest he encounters and interacts with animated versions of other players and “robots” all with their own celebration styles. Finally, after being refreshed by a Coca-Cola, he realizes that the inspiration for his celebration is within himself and he rushes to a corner flag. His celebration, though not seen, is obviously memorable as the other players watch as the glow of fireworks illuminates their wide-eyed wonder at his performance. The ad is associated with the online campaign at celebrations.coca-cola.com. Quest is part of a worldwide campaign developed at Santo, Buenos Aires by creative directors Sebastian Wilhelm, Pablo Minces, art director Maximiliano Anselmo, copywriter Pablo Minces, producer Ezequiel Ortiz, account director Ignacio Diez and planner Martin Cole, working with Coca Cola global brand director Shay Drohan, project lead Emmanuel Seuge, creative excellence head Jonathan Mildenhal. Quest was produced at Paranoid US, Paris, by director Edouard Salier, executive producers Claude Letessier, Cathleen O’Conor, Flame artist Christophe Richard, Flame assistant Amandine Moulinet, producer Anne Lifshitz, graphic designers Yué Wu, Corentin Rouge, Marthe Salier, Damien Martin, Julien Michel, Xavier Reyé, Florent Gombeau. Post production was done at Digital District, Paris, by post supervisor Peggy Tavenne, executive producer David Danesi, VFX artists Marc-Thomas Cave, Jean Lamoureux, Thomas Marque, Florian Rihn, modeler Jimmy Cave, animation team Romuald Caudroit, Remi Gamiette, Margaux Durand-Rival, Nicolas Dabos, lighting team Nicolas Belin and Nicolas Vion. Sound was mixed by Francois Roy at X-Track. Music is “Waving Flag” by K’naan.